Red Force opener Jeremy Solozano. TAROUBA, Trinidad, CMC – Opener Montcin Hodge converted his overnight hundred into a career-best but rookie Solozano was eyeing three figures of his own, leading a Trinidad and Tobago Red Force fightback on day two of their third round clash here yesterday. 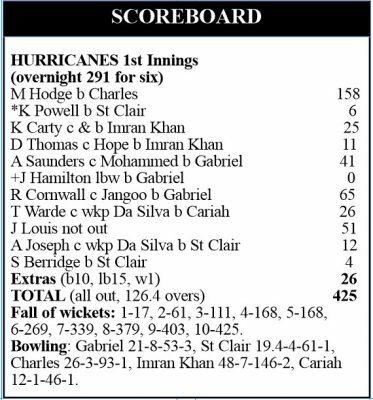 Unbeaten on 112 at the start of the day at the Brian Lara Stadium, the 31-year-old Hodge made 158 as Leeward Islands Hurricanes were dismissed for a satisfying 425 in their first innings. 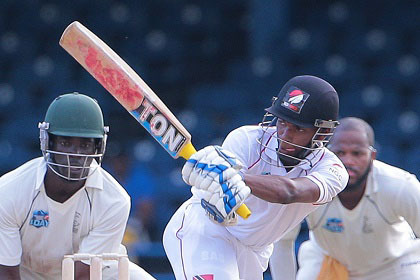 Jeremiah Louis, batting at number nine, made a breezy unbeaten 51 while Terrance Warde chipped in with 26. Test speedster Shannon Gabriel failed to add to his tally and finished with three for 54 while new-ball partner Daniel St Clair picked up three for 61. Twenty-three year-old Solozano then held the innings together as wickets fell around him, stroking an unbeaten 78 to guide Red Force to 149 for four at the close. Captain Denesh Ramdin made 31 and Amir Jangoo, 21, but Red Force lost wickets at critical moments to hand Hurricanes the advantage. Test discard Kyle Hope perished cheaply for three in the second over of the innings with just 11 on the board but Solozano combined with Jangoo in a 65-run, second wicket stand to restore order. The left-handed Solozano has so far counted 16 fours in an innings spanning 166 deliveries and nearly 3-¼ hours. Off-spinner Rahkeem Cornwall, who has claimed two for 36, then accounted for Jangoo and Jason Mohammed (6), to leave the hosts stumbling on 95 for three. Ramdin, however, played positively, hammering five fours in a 45-ball knock and helping to post 53 for the fourth wicket with Solozano. But seamer Jeremiah Louis (2-31) got his second victim when he removed Ramdin – flicking a simple catch to Akeem Saunders at mid-wicket – to leave Hurricanes firmly in control. Hodge had earlier extended his seventh wicket stand with Warde to 70 and then posted another 40 for the eighth wicket with Louis before he was eighth out, bowled by off-spinner Bryan Charles. Louis punched six fours and a six off 61 balls to ensure the tail wagged further.